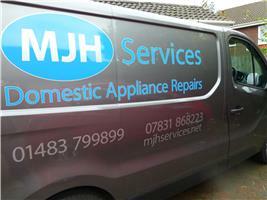 MJH Services was established 26 years ago in Woking in 1992 but has been in the Domestic Appliance Business for 36 years now. I repair most of the major appliances from all the leading manufactures. Surrey and parts of Berkshire. Woking, Guildford, Byfleet, West Byfleet, Pyrford, Old Woking, St Johns, Knaphill, Bisley, Westend, Camberley, Worplesdon, Jacobs Well, Sutton Green, Horsell, Chobham, Cobham, Weybridge, Hersham, Walton on Thames, Woodham, Addlestone, Chertsey, Ottershaw, Windlesham South Ascot, Sunningdale, Bagshot and surrounding areas. Woking, Guildford, Byfleet, Camberley, Farnham, Weybridge, Walton, Horsley, Godalming, Bracknell.